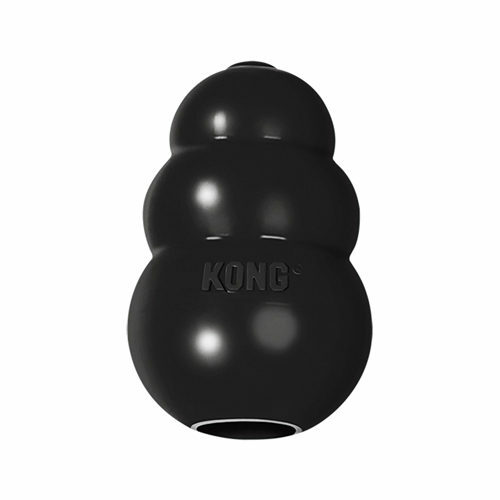 KONG Extreme is an extra strong dog toy, great for dogs that easily break toys. The dog toy can also be filled with all kinds of food and dog biscuits. Available in various sizes. The KONG Extreme toy is made from extra strong rubber, making it ideal for dogs that can easily destroy normal dog toys. We cannot guarantee that the KONG Extreme will not break eventually, but it is highly likely that this toy will last longer than any other. The KONG Extreme can also be filled with all kinds of food and dog biscuits. Please note: While the KONG Extreme is one of the most durable toys available, powerful dogs, like the Staffordshire (Bull) Terrier, may be able to break it. Have you used KONG Extreme before? Let us know what you think about this product.